CircleCI CEO Jim Rose will share a product roadmap for 2018. We will also have lightning talks from Crowdworks and Toreta. Drinks and snacks are available, and English sessions will have Japanese interpreter. 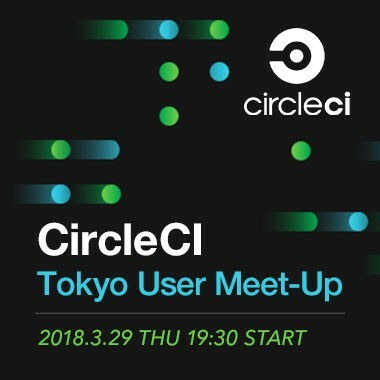 Join the Circle CI team and user community on 03/29 at TECH PLAY. We will end the evening with drinks, snacks, and conversation. Jim joined CircleCI in 2014 through the acquisition of Distiller, an iOS- only continuous integration service. He was Distiller's co-founder and CEO. Prior to Distiller, Jim was the co-founder and CEO of many companies; Copious, a social marketplace backed by Foundation Capital, Google Ventures, amongst others; Vamoose, a vertical search engine in the travel space acquired by Internet Brands; MobShop, which invented and patented the idea of ​​group buying online in 2000, raised over $ 49 million in funding, and whose IP was acquired by Groupon. From returning to Japan, I joined Yahoo in 1999 and serve as the planning manager of various services such as Yahoo! Chiebukuro. From January 2010, Born in 1977. I grow up in Los Angeles for about 10 years, as a Country Growth Manager of The Japanese Branch Of Faith Book, We Will Greatly Grow Grow Our Services Domestically. Established Anchor Star, A Company That Supports Independent Country Managers Who Are Independent From Japan In 2002 And Are In Charge Of Entering Japan. In May 2005 He Took Over The Country manager of the kick starter.